Christian Hebraist and polyhistor; born at Wernigerode Feb. 21, 1683; died at Hamburg July 25, 1739. He studied at Wittenberg, and traveled in Holland and England in the interest of science, coming in contact with Vitringa, Surenhuis, Reland, Basnage, and others. He especially occupied himself with the study of Oriental languages and literature, of which he became professor at the Hamburg gymnasium in 1712. 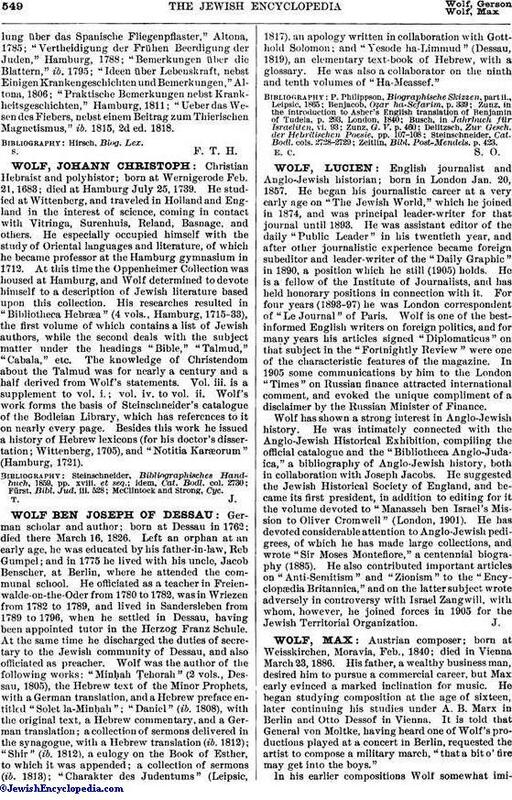 At this time the Oppenheimer Collection was housed at Hamburg, and Wolf determined to devote himself to a description of Jewish literature based upon this collection. His researches resulted in "Bibliotheca Hebræa" (4 vols., Hamburg, 1715-33), the first volume of which contains a list of Jewish authors, while the second deals with the subject matter under the headings "Bible," "Talmud," "Cabala," etc. The knowledge of Christendom about the Talmud was for nearly a century and a half derived from Wolf's statements. Vol. iii. is a supplement to vol. i.; vol. iv. to vol. ii. Wolf's work forms the basis of Steinschneider's catalogue of the Bodleian Library, which has references to it on nearly every page. Besides this work he issued a history of Hebrew lexicons (for his doctor's dissertation; Wittenberg, 1705), and "Notitia Karæorum" (Hamburg, 1721).